Life for farm families in Seneca Township revolved around family, Church and school. That was certainly true for the Alvin and Martha Scheckel family, who lived on a 238-acre farm out on Oak Grove Ridge. We, like our Catholic neighbors, observed the rites and rituals of the Church: Ash Wednesday, Christmas Eve Midnight Mass, Mass in Latin, Lent, Easter, Pentecost, Advent, High Mass and Low Mass, confession, Communion and confirmation. Forty Hours Devotion was a special period of continuous prayer in solemn exposition before the Blessed Sacrament. Sunday church was always at 8 a.m. for a High Mass and 10 a.m. for a Low Mass. The choir sang at High Mass and used the tall lighted candles. The first priest I remember was a big Irishman by the name of Father Charles Brady, who came to St. Patrick’s in Seneca in 1947, when I was five years old. Father Brady was the priest that gave first Communion to the three Scheckel boys. First confession and first Communion were a big deal in the Church. The sisters from Prairie du Chien were in charge of the first Communion class. First Communion was in early June when kids were finishing second grade. For me, that was June 11, 1950. Most kids made their first Communion at age eight. The good sisters versed us on how to go to confession, what words to use and what prayers to recite. On first Communion Sunday, the communicants occupied the front pews; girls on the Blessed Virgin Mary side, boys on the St. Joseph side. Each communicant received a prayer book, first Communion candle, scapular and rosary. The Catholic nuns at Seneca taught the Scheckel boys Latin during the two-week summer session, so that we were able to serve at Mass. It was a great thrill for us when, in grade 6, we “got to ring the church bell.” It took two boys to do the job. Both of us would jump up as high as we could, grab the rope at the apex of our leap, hang on and ride that rope down! The weight of two sixth-grade boys was just enough to get that massive bell ringing. It was a great thrill for us when, in grade 6, we “got to ring the church bell.” It took two boys to do the job. Both of us would jump up as high as we could, grab the rope at the apex of our leap, hang on and ride that rope down! The primary grades had Saturday morning religion classes throughout the school year. Mass was at 8 a.m., followed by religion class. The Baltimore Catechism was the definitive on the teachings of the Catholic faith. Each week, we were assigned to memorize four or five questions and answers. Father Brady was succeeded by Father Aloysius Bauman in 1951. Father Baumann came out to visit us on the farm. It was his policy to visit every parishioner in their home or farm once a year. St. Patrick Parish published the annual financial report every July. It was a five-page document listing the income and expenses of the parish, as well as how much each family contributed to the church. The report would engender much discussion, if not gossip. Father J. Kelly Cosgrove was at St. Patrick Parish until 1959 and was replaced by Father Frank Zoll. Father Paul Flad was appointed in 1966. He was a son of the owner of an architectural firm in Madison. The interior of St. Patrick Church was extensively remodeled during his tenure. The ornate main altar was removed, as well as the two side altars. A smaller altar was installed in the middle of the sanctuary, and the priest faced the congregation. The marble communion railing was removed. The organ in the choir was removed and repositioned in the front of the church. The choir loft was remodeled into four classrooms. English replaced Latin as the language of the Mass. Fathers James Murphy, Tom Smith and Eugene Wolf followed. 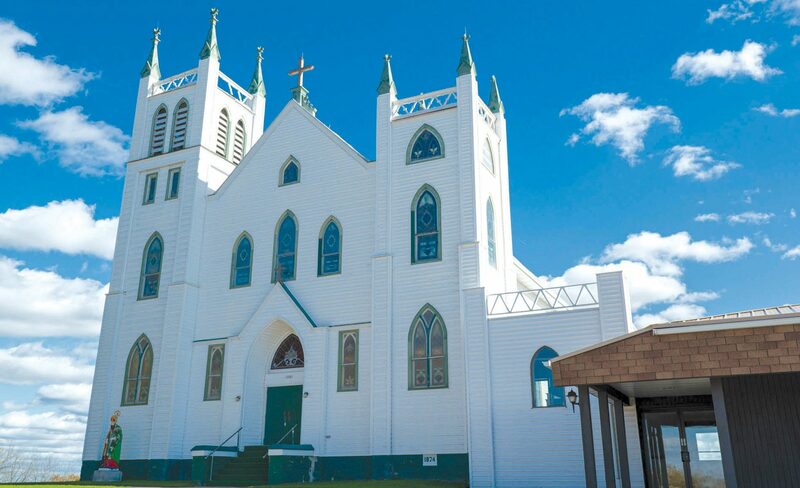 The current pastor, Father Zacharie Beya, has an additional parish, St. Mary Parish, in Gays Mills and, through the ups and downs, St. Patrick Catholic Church still proudly sits atop the Seneca ridgeline, as it has for 143 years. St. Patrick’s Catholic Church, Seneca, sits atop the highest point in the hill country of Crawford County. In November 1855, a French priest, Father Lucien Galtier, came up on the ridge from Prairie du Chien and celebrated Mass in the home of Robert Garvey. In 1859, two mission churches were constructed in the area. St. Mark Church was constructedas a log cabin in Copper Creek, six miles northwest of Seneca. The remnants of a cemetery remain. 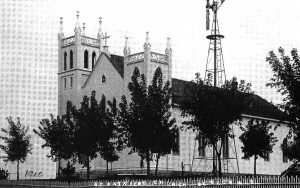 In 1866, St. Peter’s, was erected a few miles south of Seneca. Part of the burial ground is still there. In 1869, missionary priests from Prairie du Chien and Father Patrick Murphy, from Rising Sun, met with numerous Irish Catholic families in the Seneca area to plan for a permanent church site. Bishop Michael Heiss appointed Father Christian Verwyst to be the first resident priest. Land for the present church was donated by Edward and Thomas Garvey. Father Verwyst set aside a large area in the middle of the cemetery as a burial plot for the Garvey family. A pine tree was planted at each corner of the plot. Later, the cemetery was expanded beyond the Garvey plot. The main path, lined by pine trees, passes right over some of the early Garvey graves. St. Patrick Catholics believe the early Garvey parishioners really don’t mind. Work on the new church was delayed due to Father Murphy’s poor health. He died in Milwaukee on Oct. 16, 1874. His last request was to be buried in the cemetery of St. Patrick Parish. His request was fulfilled. St. Patrick was dedicated a few days after Father Murphy’s death, on Oct. 25, 1874. A big statute of St. Patrick was assembled inside the church. In 1969, it was moved to a niche on the outside front of the church, where it remains today. The main altar was large and extremely ornate. There were two side altars, one on the left for the Blessed Virgin Mary, and one on the right for St. Joseph. A brick parsonage was erected in 1898. The surnames on the weather-beaten stones will attest to the Irish heritage of the parishioners: Garvey, Callahan, Cleary, Crowley, Finley, Fitzgibbon, Foley, Joy, Kane, Kelly, Lawler, Leary, Lynch, Mahoney, Maney, McNamara, Meagher, Murphy, O’Neil, O’Shaughnessy, Snell, Bernier and Sullivan.